Picking up a new language is never easy. Trying to learn basic electronics at the same time is just asking for trouble. Yet the world of Arduino is one of the more rewarding skills out there, and well worth putting the effort into. Knowing where to start is tough, however. The Arduino Project Handbook, written by Mark Geddes and published by No Starch Press, is a fantastic place to start. With 25 exciting projects – each with full color wiring diagrams, pin connection tables and photographs – you too will soon be making things like a laser tripwire alarm or joystick controlled laser cannon. Even better: this substantial book is just $25 direct from No Starch Press, which includes both a print and digital copy. When I first started learning Arduino, I used an all-in-one starter kit that came with an official Arduino Uno board, a book co-authored by the founder of Arduino, and some instructions for about 10 projects. It cost close to $100 at the time. The projects were all rather simple, with each one essentially introducing a different component. There wasn’t much progression, and at the end of doing them all, I felt a little unfulfilled. You could have done them all without an Arduino. I was still unsure as to how I would go about building the more elaborate, fun stuff. With most of the cost price taken up by the official board, there was little left in the kit for additional starter components. It was all a bit underwhelming, and I was done with it in a weekend. Nowadays, you can buy great value clone-based starter kits for under $30, stuffed full of interesting components like an LED matrix, LCD screen, or RFID reader. The only problem with these is that the documentation is seriously lacking; or rather, it’s completely non-existent. The Arduino Project Handbook is a great complement to these kits. Though the name implies the Arduino Project Handbook is merely a collection of projects, it does include a short section on the background and history of Arduino, before delving into working with the Arduino IDE. The first project is the gold standard “Hello World!” programming tutorial of electronics: the flashing LED. 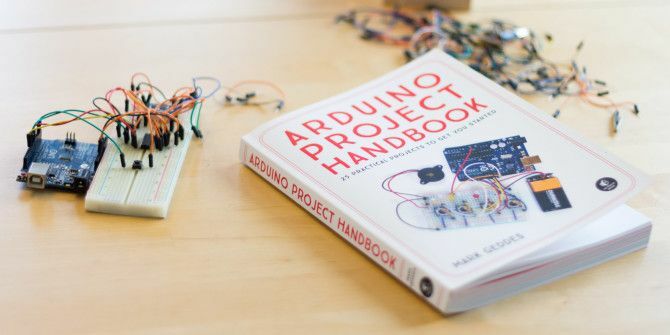 The Arduino Project Handbook is unique however in that it breaks down every line of code – even all those curly brackets – to help those with zero programming experience understand exactly what’s going on. Not only does it cover the absolute basics, it then progresses through to combining components and structuring larger projects. This is an important skill: anyone can copy a few lines of code, but understanding the fragments and then combining them into something greater than the sum of the parts is where the real difficulties lie. There’s no repetition though, so concepts explained in earlier projects aren’t explained again. It might be tempting to jump straight to a joystick controlled laser, but working through the projects in order – particularly the early projects – will be the best way to learn. Speaking of which, all the project code is available to download from the No Starch Press website, but I’d strongly suggest you type it out by hand. While this may be tedious, it ensures you’re mentally examining each line of code. In the process, you’ll likely introduce errors, too. Learning how to identify relevant error messages, find the bug, and correct it is another important skill that can’t really be taught in a book, but will only come to your through experience. If you come across an unfamiliar function name that isn’t explained in the book, a quick Google will reveal all. 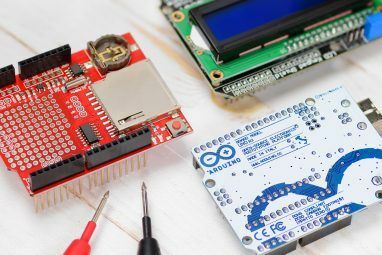 We’ve talked about what you’ll find in a starter kit What's in Your Arduino Starter Kit? [Arduino Beginners] What's in Your Arduino Starter Kit? [Arduino Beginners] Faced with a box full of electronic components, it's easy to be overwhelmed. Here's a guide to exactly what you'll find in your kit. Read More before, and in the book’s appendix you’ll find a similar breakdown, as well as technical pinouts for the hardware. Sound-based Memory game, similar to the classic Simon. Rocket launcher, using a filament bulb and matchstick. Joystick-controlled laser, similar to the autonomous laser turret Pew Pew! How To Build A Laser Turret With An Arduino Pew Pew! How To Build A Laser Turret With An Arduino Are you bored? Might as well build a laser turret. Read More I put together a few years ago. Ghost (or rather, EMF) detector. RFID card entry system (you could combine this with a heavy duty magnetic door lock, as we did here Make An Auto-Locking Office Door with Smartphone Proximity Sensor Make An Auto-Locking Office Door with Smartphone Proximity Sensor We'll be setting up a Raspberry Pi with a Bluetooth adapter to be on the lookout for when your smartphone is out of range, and snap a relay into action to lock the door. Read More ). The projects are broken into 7 parts, covering: LEDs, Sound, Servos, LCDs, Counters, Security, and Advanced. To test out the quality of the instructions, I built project number 16, an electronic die. Partly this was because I’ve never tried to use a 7-segment LED display before, so I knew I couldn’t cheat. Apart from one of my buttons being dodgy, the wiring and code worked first time. The clear, full-color diagrams, and tables of pinouts are easy to understand, and the project used only components I had in my starter kit. The code is well documented if you wanted to make changes, like adjusting the animation speed of the dice shake. 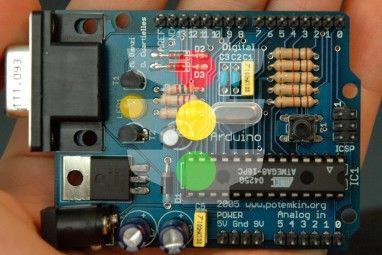 Should You Buy the Arduino Project Handbook? If you’re new to Arduino, you should absolutely buy this book. Skip straight past the branded all-in-one starter kits that include a couple of boring projects. This books walks you through not only the simple, beginner’s stuff that everyone does; but also the complex, larger projects that demonstrate the real power of Arduino. These projects will genuinely keep you motivated to continue learning. Having a practical, exciting thing to make is more motivating than simply making a thing for the sake of it. You will still need to buy a few components – such as the sentry gun firing mechanism – but these cost a few dollars. Explore more about: Arduino, Electronics, MakeUseOf Giveaway. I see your listings of Giveaways on the site, yet none that I've looked at note how to enter the Giveaway. I've been so interested in learning about arduino and seek the possibilities of what could be created.